Light weight polyester satin with silky feel for comfy night sleep. Great gift for family or friend. Good choice for Christmas gift. Hand wash below 30 Celsius Degree. Wash separately or with like color, use neutral detergent and wash inside out can help protect fabric color. Iron on low heat. Any dry cleaning methods are compatible. 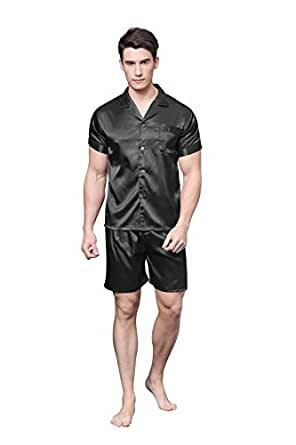 TONY & CANDICE men's silk like satin short sleeve pajama sets. Made from silk feeling satin polyester. Short sleeve top with one front pocket on chest. Elastic waistband shorts with one button fly. Hand wash below 30 Celsius Degree. Iron on low heat. Any dry cleaning methods are compatible. M: Fit Chests 36-38", Fit Waists 30-32", Top Length 28", Shorts Length 18"
L: Fit Chests 40-42", Fit Waists 34-36", Top Length 29", Shorts Length 19"
XL: Fit Chests 44-46", Fit Waists 38-40", Top Length 31", Shorts Length 20"
XXL: Fit Chests 48-50", Fit Waists 42-44", Top Length 32", Shorts Length 21"
They look good but after a few washes, the dye still comes out onto the sheets. Has ruined some good sheets.